If you are looking for information on the Salsa Rico Fresh Mexican Grill franchise business opportunity, Salsa Rico franchises or Salsa Rico Mexican food franchising, then you have come to the right place. On the coast of Baja California the Pacific breezes are balmy and life is just as easy as you've heard. Just fresh, clear flavors served in a relaxed atmosphere. Salsa Rico salutes that fresh and honest way of life. We make our salsa daily and you can taste the pure goodness that comes only from the freshest ingredients. So kick back and enjoy! 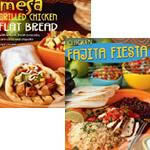 One-pound burritos and enchiladas are just the start to Salsa Rico's baja-style Mexican offerings! Quesadillas, nachos and of course tacos, served on your choice of flour or corn tortillas, complete the experience of the Pacific. With flexible build-outs including stand-alone and in-line versions, Salsa Rico is perfect for both single and multi-site development!